One Japanese lab is hard at work producing glow in the dark silk. But the soft skeins aren’t treated after the silk worms have spun their lot, but instead are being produced directly from a cast of genetically engineered worms. Instead of traditional off-white fibers, the special silk worms spew out fluorescent hues of red, orange and green, which can be turned into usable, wearable fabrics. In the past, researchers have created colorful silk made by feeding the spinning silkworms colorful dyes, but this breed of worm create their colorful threads through genetic engineering. First developed by Toshiki Tamura at the National Institute of Agrobiological Sciences, the transgenic worms create colored fluorescent protein, which is then transferred to the silk that they obsessively spin. The fluorescent proteins were derived from the DNA of other organisms that produce fluorescent molecules, like Discosoma Corals, Fungia concinna coral and jellyfish, which produce red, orange and green glowing hues, respectively. Once injected with the other organism’s DNA sequence, the silkworm genome formed a transgenic animal, able to spin three colors of glowing silk. Over 20,000 of the fluorescent silk producing transgenic worms have been fostered and taken care of. Like normal silk worms, they thrive on a diet of mulberry leaves, but unlike traditional worms, the transgenic silk is more fragile. The scientists had to develop an alternative harvesting process, which involves heating the cocoons to a lower temperature in order to preserve the rich fluorescent color. The glowing fabrics made from the fluorescent silk have thus far maintained their rich vibrancy for two years. The already colored fabric takes away the dying step of clothing production, which can be harmful and toxic to the environment. Researchers estimate that the transgenic glowing silks would only be slightly more expensive than regular silk, making it an affordable, more eco-friendly alternative. Sounds like a cheap and novel idea, but if I was a silkworm I would want to dye those silk engineering technocrat people with barium meals of Day-Glo purple, then bring on the x-ray eyed purple people eaters for a welcome feast. Sounds attractive as silk. Perhaps those "boffin" people should instead consider silk weaves that incorporate intelligent fibres with which to create a range of even more dazzling effects using variable light colours. this sounds highly dodgy- genetically engineered insects- I certainly don't want to wear clothing produced by genetically engineered insects Genetically Modified Insects: Science, Use, Status and ... - ICGEB www.icgeb.org/~bsafesrv/pdffiles/Col6_Beech.pdf? by CJ Beech - Cited by 3 - Related articles and risk management they are essentially equivalent to GM insects. ..... Similarly, transgenic silkworms have been used for the production of modified. 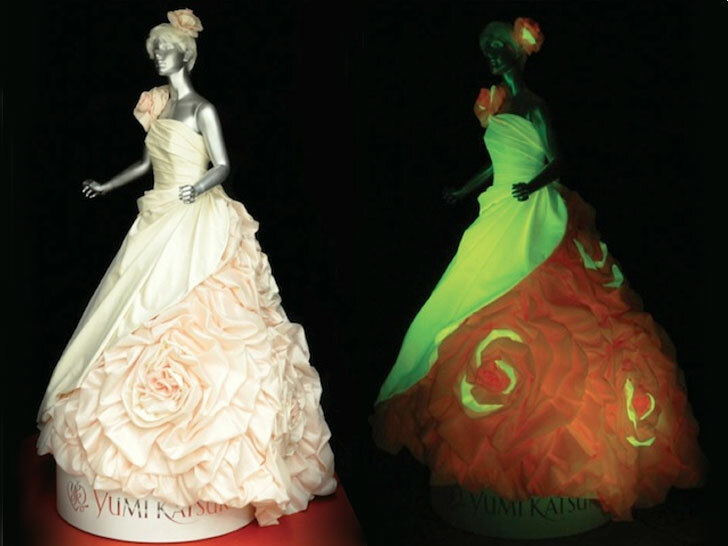 One Japanese lab is hard at work producing glow in the dark silk. But the soft skeins aren�t treated after the silk worms have spun their lot, but instead are being produced directly from a cast of genetically engineered worms. Instead of traditional off-white fibers, the special silk worms spew out fluorescent hues of red, orange and green, which can be turned into usable, wearable fabrics.